Finally it happened. The long-awaited check-in feature for Latitude got live all over he world. It was a race-car with bike-tires. Latitude without check-ins is missing something. Now you can. And of course, with special features. 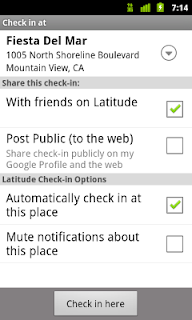 It not only checks you in automatically on places you can specify, but it also check out automatically. This is definitely a big thing. 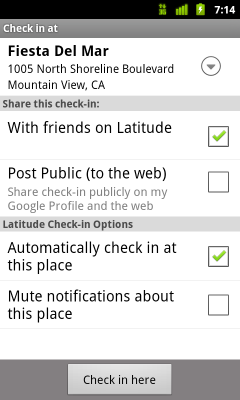 And in addition to that, you get get notifications to check-in to a site. So if you run into a venue, a notification pops up and you can click to check-in. Google made a video for that and it explains it quickly. This looks some kind of unimportant on the first sight, but this will give Foursquare and all the other check-in services a hard time. That automatic feature is pure gold. How many times did you miss to check-in somewhere? No more. With over 10.000.000 User before that feature was introduced, it might be interesting enough. This update is available for Android 1.6+ and comes with the Google Maps app.